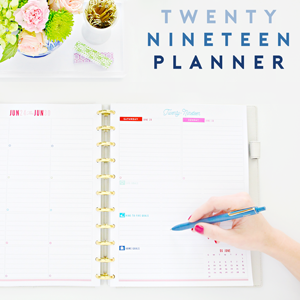 Whenever I am a little stressed out, I turn to organization as my form of therapy. I have always found it to be a relaxing exercise; and every time I finish a project I feel like I go from from overwhelmed to proud and excited. And who knew anyone could feel that way after spending a few minutes tackling their cord situation? If you would have told me that this project was going to make my heart go pitter-patter, I would have laughed and maybe even thrown a good eye roll your way. In fact, I have been putting off this little organizational task for far too long, because I was sort of dreading it. 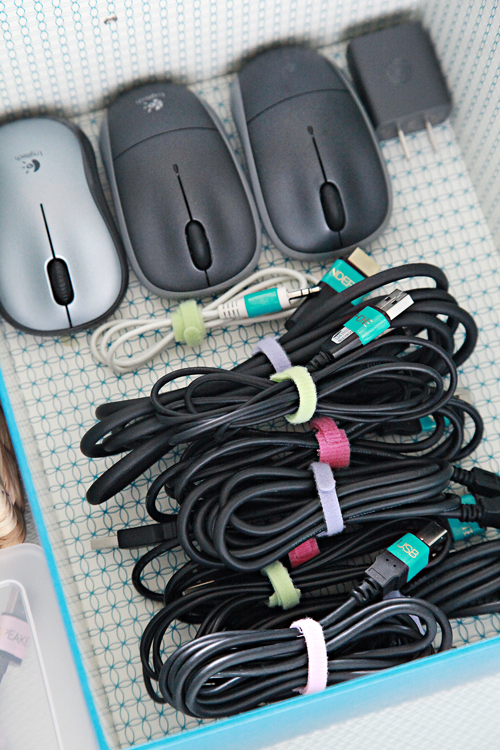 Organizing cords doesn't tend to provide jaw dropping before and afters after all. But you know what? 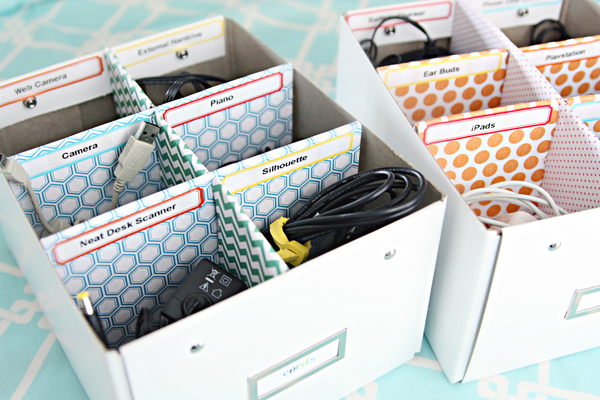 This little organizing project was instantly rewarding and gratifying. We have fallen victim to the digital world, and with that we have accumulated cords in massive quantities. USB cables for our computers, scanner and camera, charging cords for our video game controllers, battery cells, bluetooth speakers, iPads and phones, as well as power cords for small electronics such as my craft machines, photo printer and external hard drive. It came to a point where I didn't know what cord went with what device, and even worse, they were consistently tossed into one of two bins and it created quite the jumbled mess. 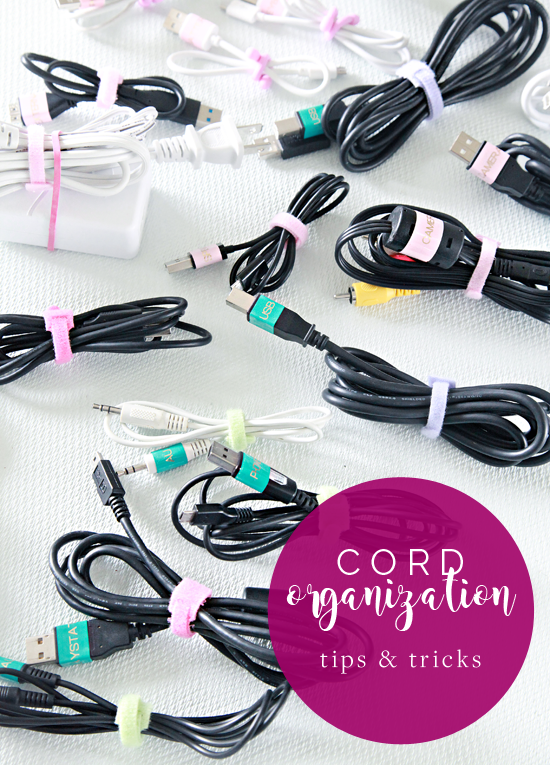 We actually did maintain the above cord organization fairly easily for the first year or so, but I made a small mistake the first time around with the labels I selected. As we swapped out devices and our electronic inventory changed, I wasn't able to easily update the slot labels (or expand on what we already had). After I attempted to remove a few of the labels, the paper started peeling and after another year the box dividers had lost their structure and good looks. I continued to use the boxes for cords, but the mess eventually took over. As I considered whipping up a few new dividers, I realized that my problem was more in the labeling than the separating. I decided that the labels would serve me better on the actual cords vs. inside of a divided box. 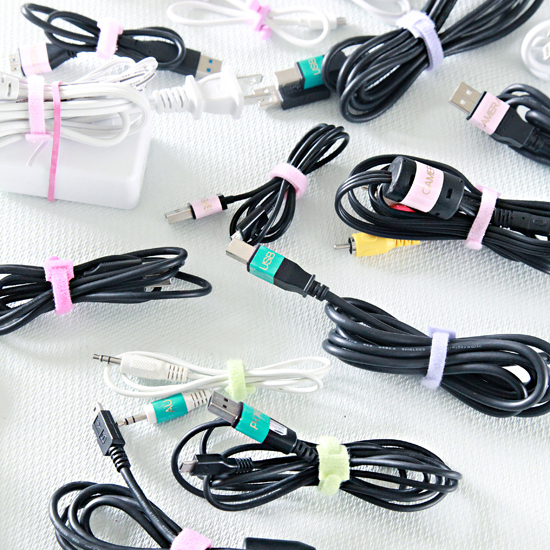 Before I got started on my labeling, I went through each room in our home and gathered every last stray cord. This was a really important part of the process, as I find it to be much more beneficial to tackle a single category all at once vs. working room to room and dealing with a cord problem time and time again. 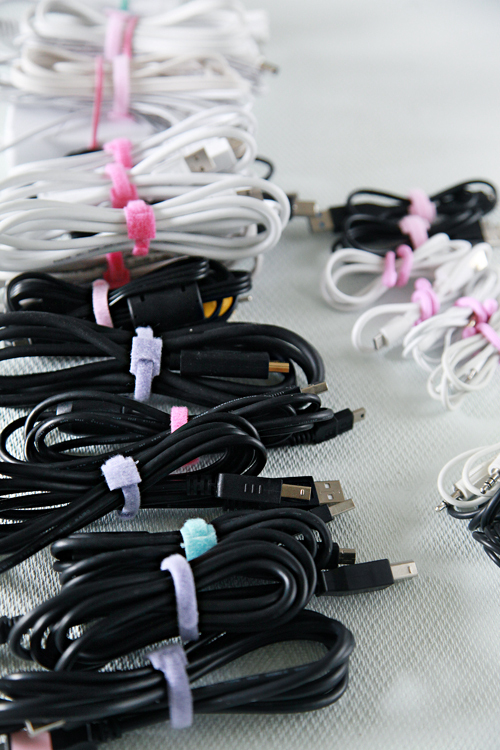 From there, I sorted them down and wrapped them with cord ties. 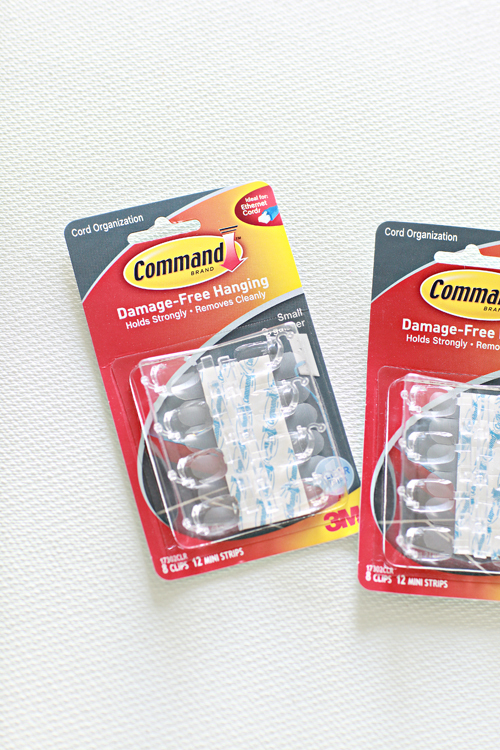 There are endless cord wrangling supplies on the market, but there are a few key organizers I find myself going back to frequently. 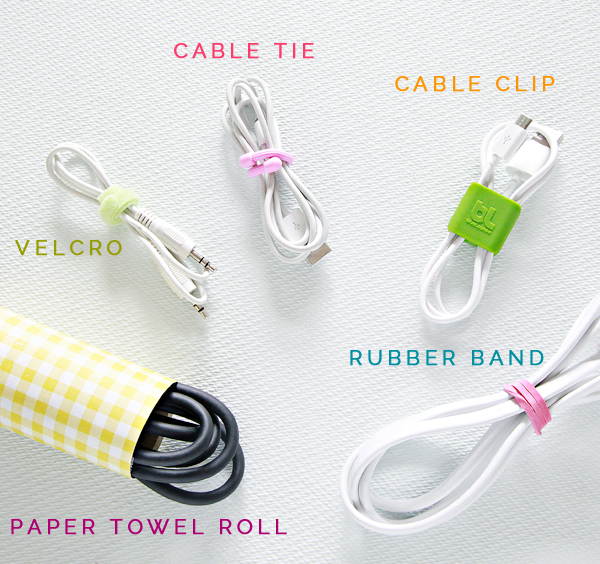 PAPER TOWEL ROLL - Just cut down the cardboard paper towel roll to your necessary size, cover with a piece of cardstock and you have yourself some sturdy (and darling) cord storage. 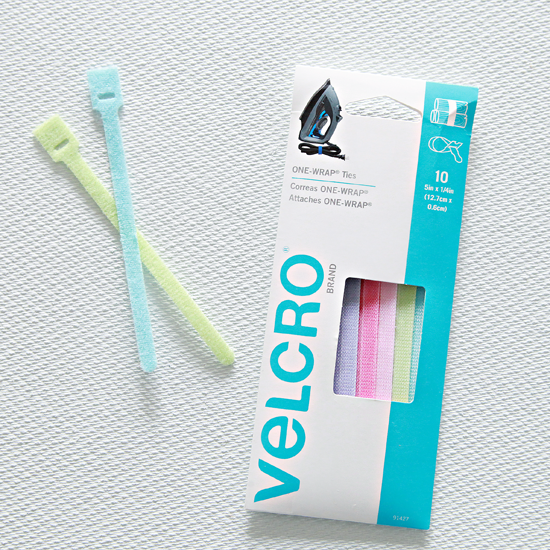 VELCRO - These little wraps are ridiculously handy, inexpensive and easy to use. They also come in a variety of colors and sizes which is a nice bonus. 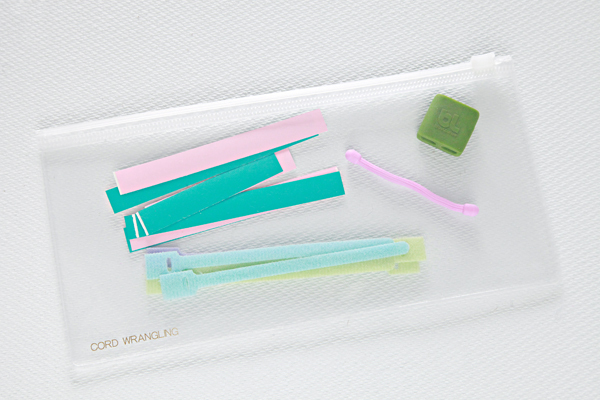 CABLE TIE - I also love these little cord helpers, but they are a little pricier. I attempted to use a paperclip in a similar fashion and it definitely didn't work as well. The rubber coated wire protects your fingers and cords and they are easy to bend. These ties also come in a variety of sizes and colors. 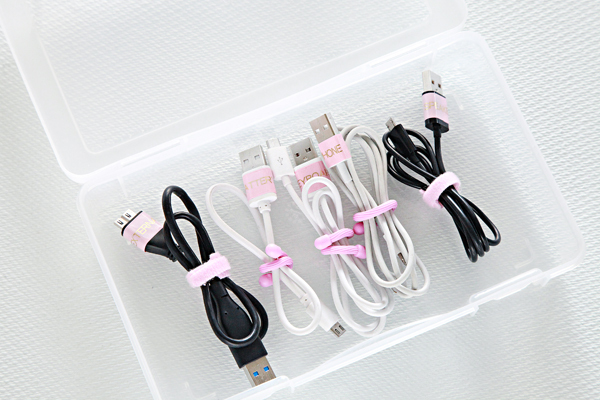 CABLE CLIP - These are the perfect size for standard iPhone and iPad charging cords, and always look nice in any drawer or pouch. RUBBER BAND - Because sometimes cords are bulky and just a wrap or two of a rubber band is all that is needed to take control at no cost. I already had a few cable ties on hand, but knew I would need to up my wrangling game so I picked up three packages of the Velcro wraps (on sale for $2.69 for 10 wraps at JoAnn). They made it easy to control all of the different cord types and sizes. When it came to labeling the cords, I knew I wanted to label the cord directly. I also wanted to select a label that is easy to read and will last over time. 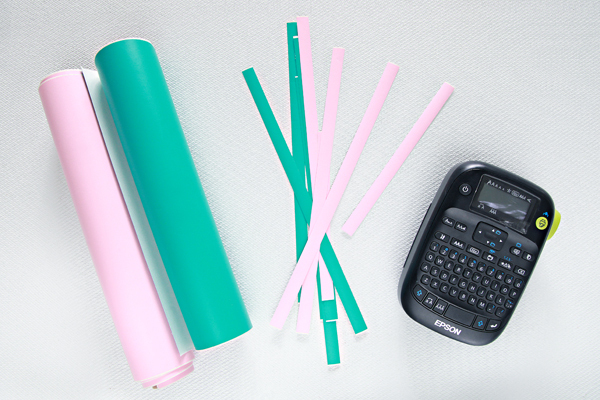 Washi tape and a label maker is a good option, but not all Washi is created equal and the busy pattern on many of the tapes can make it hard to read the label. So this time I turned to a couple rolls of vinyl that I already had on hand. I used my paper slicer to cut a few strips, I liked that it was adhesive (but not permanent) and the colors would still allow the labels to be legible. I simply cut the strips to size and wrapped them around an end of each cord. I then printed a label (onto clear label tape) and wrapped that over the top of the vinyl. 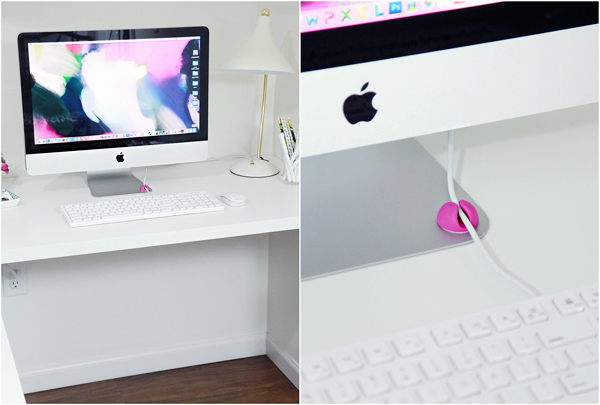 At first it wasn't intentional, but I quickly realized it worked out well to use pink for any cords that belong in my office, and the tealy blue for all of the family specific cords. The common cords and chargers were tossed into a box to be stored in our movie cabinet. For now, a small basket holds all of my bulkier cords for my office electronics, and a clear pencil case worked well for the smaller, more frequently used cords. I actually used the pencil case to create auto boxes for our boys this summer, and they have been awesome (especially during our 24 hour road trip). 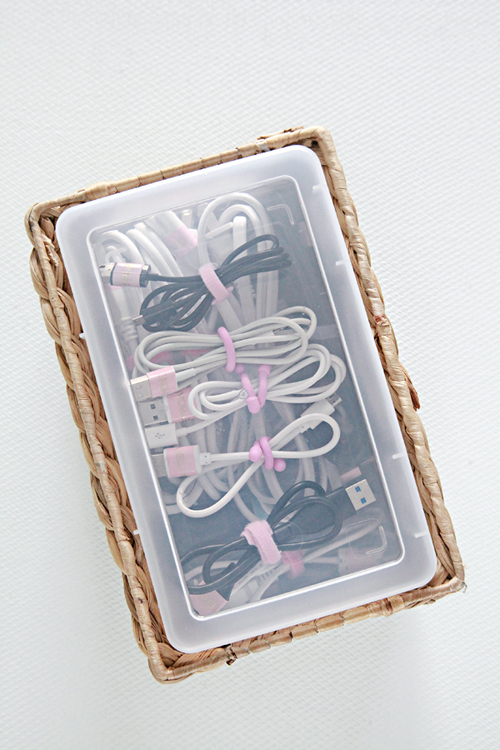 Each boy has a box with their headphones, device charger cord and car adapter plug. And I still stand by my favorite earbud case on the planet; a travel size cotton swab case. 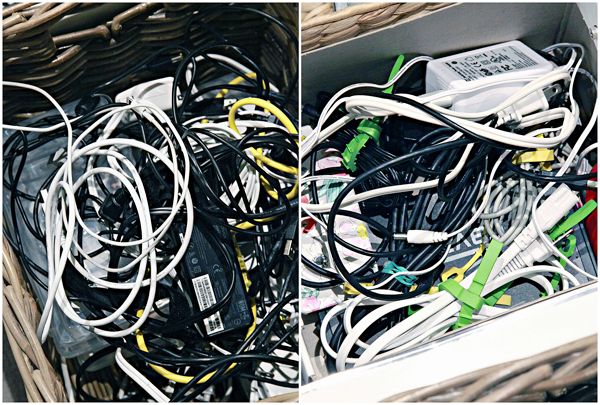 And just when you thought that I couldn't possibly have more cords to wrangle and organize, you would be wrong. Can I get another #sigh? I don't know who works at that desk but it certainly wouldn't be a 5'1" blonde gal named Jen who writes an organizing blog. Nope. The cords looked a little intimidating, but it was nothing that some Command Hooks (designed specifically for cord control) couldn't handle. I ended up using both the smaller Cord Clip version and a larger Round Cord Clip option. These were perfect for holding all of the cords up out of sight on the underside of my desk (which is also where the power strip is affixed). Not the prettiest view but it doesn't matter because I can't see it! Wahoo! I used a couple of the Cord Clips behind my Mac as well. I was never a fan of the wireless keyboard that came with my computer, so I added a USB version. I like the full keyboard much better, but the cord needed some wrangling so I could keep a clear work surface. This little pink cord holder worked great, and another Command Hook on the back of the monitor holds the extra cording up and out of the way. Just a few minutes of time made such a difference! 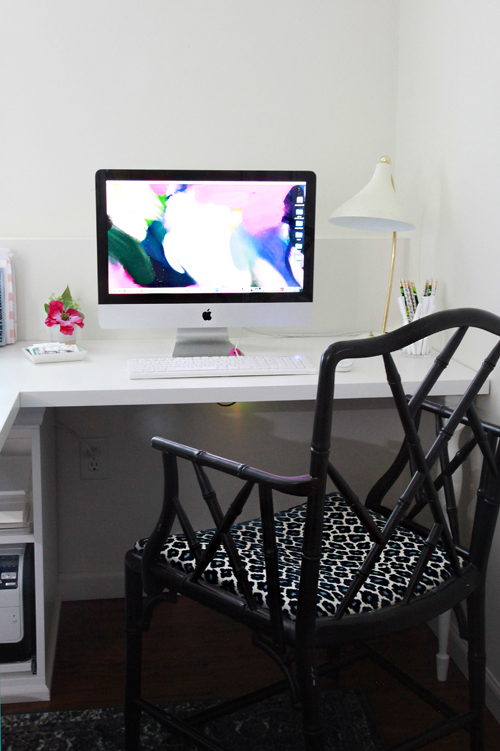 This project reaps such tremendous rewards, not just for myself and my workspace, but for the entire family. No more confusion over what cord belongs to which family member, or pairs with each type of device. And to be sure I wouldn't have a hard time maintaining this system this time around, I used a small clear pouch to hold all of the extra cord organizing supplies (and tossed it right into the storage box with all of the cords). I even cut extra strips of vinyl so all I need is the pouch and my label maker and any new cords will quickly be identified. I just love that a little football watching and cord organizing brought my stress level down a few notches. And funny thing is, I wasn't even stressed about the cords. 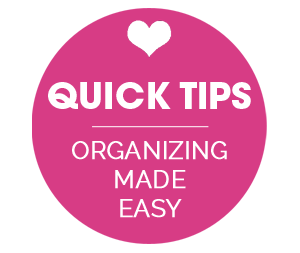 Do you have any organizing projects you have been dreading? Or have you tackled one that wasn't so bad after all? What is your favorite form of stress relief? 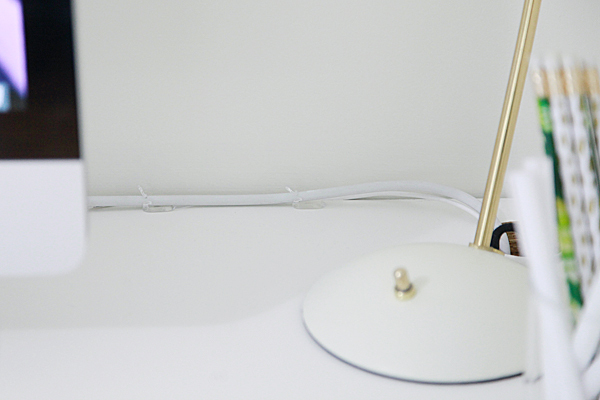 Looking to discard old cables and cords? This post has a few great recycling options. I am off to my local Joann's store to get some velcro cord holders. And I'm going to label those suckers too! Thanks for the inspiration. 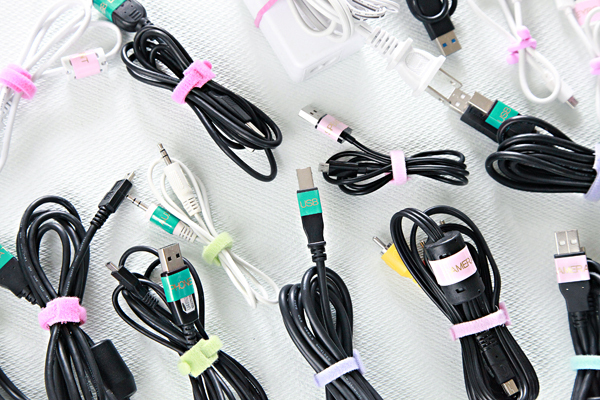 Cord tangle is the bane of my life so this is super useful - thank you! ok WAIT. GOLD label maker font? How? Is this specific to your label maker or can the cartridge fit any label maker? I typically purchase a new cartridge about once/year from Amazon, but I just looked and they don't seem to be available right now. 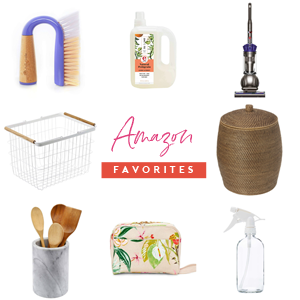 (here is the link in case it is a short term low inventory fluke: http://amzn.to/2cf65Gi). Jen, can you give me the deets on your earbuds, please? After losing mine and using my son's earmuff-size headphones for the last year, I'm desperate for some sweet and all mine. Thanks in advance! Love your site and these tips. Thanks Stacy! 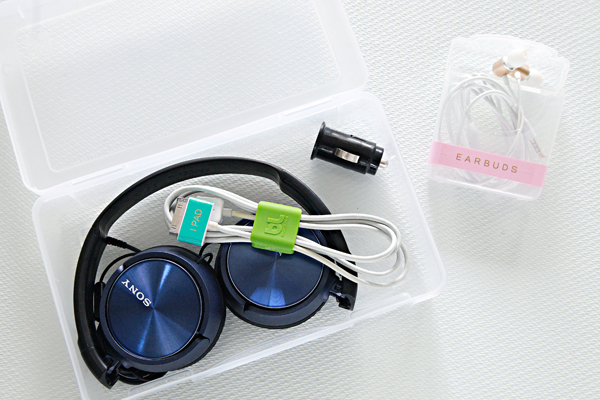 I have gone through a couple pairs of earbuds over the last few years, and these particular ones are from Amazon: http://amzn.to/2cfYBCJ. They are alright, you pretty much get what you pay for as they aren't too pricey. 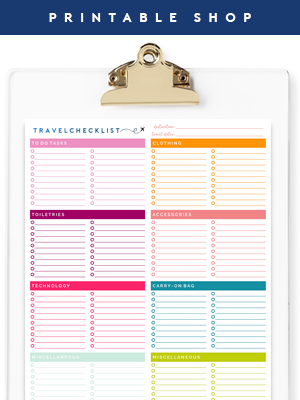 OK, totally random question... but what is the brush stroke font you use for some of the lettering (namely in this post, "shop this post", and "organization" in the cord organization magenta circle at the top? -are they the same???) Are these particular ones yours, or did you download it off a site? Thanks for the great ideas and so beautifully done, too! 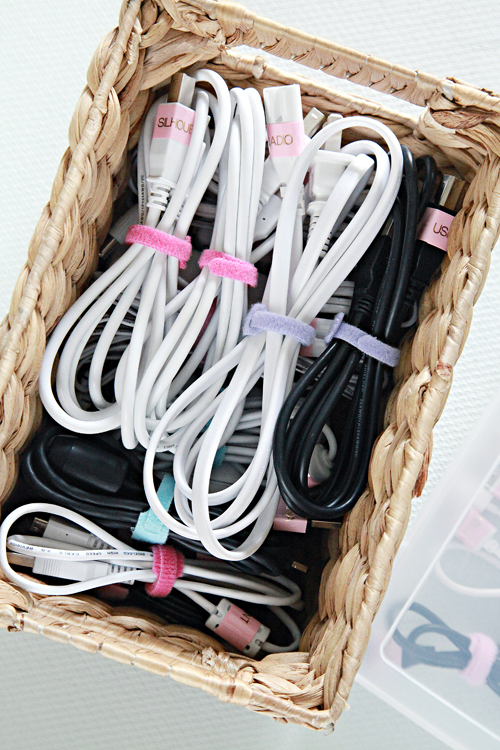 Another item to add to your list of cord storage: I love using elastic hair bands and hair ties. I get them in a variety of colors too. 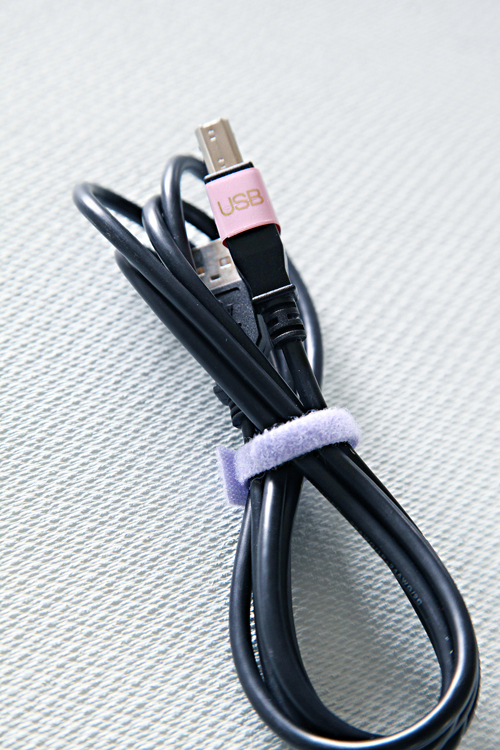 The hair ties are best for cords that you use a lot as the knot makes it easy to pull off the cord. They both work great, cheap, and are very neat. Great suggestion, I will have to remember that down the road! Thank you so much for the tip Marianne! Wait a sec... Love all this, and I have questions! 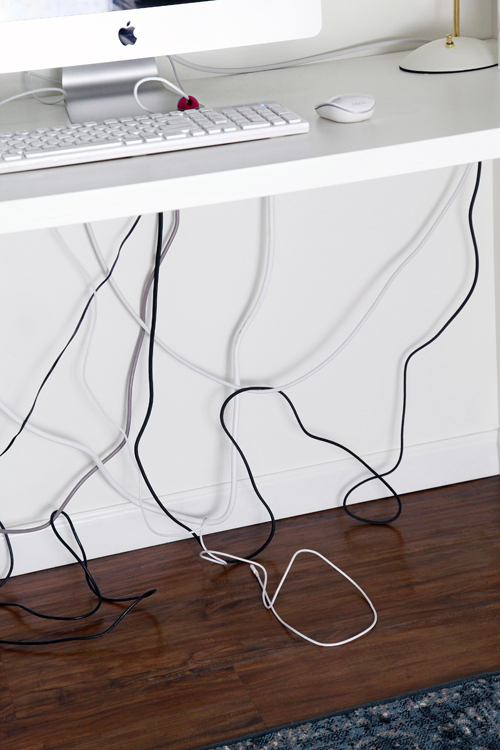 Can you tell us how you got that power strip attached under your desk? And do you coil all the cords up under there somehow? I'm RIGHT in the middle of cord organization under my home office desk, so am completely in need of guidance! 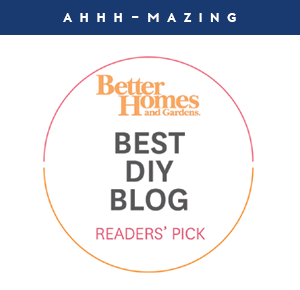 Thanks for all you do -- your tips are SO inspiring! Absolutely Diana! The power strip is attached with two small screws on each end, but I have also used heavy duty velcro in the past without any issues. And yes, the cords are gathered with some of the cable ties mentioned above, and then clipped up. I don't have a photo of the back of the computer handy at the moment, but will update you with some shots tomorrow (and link them right here). There's another way to attach those velcro straps, so that they stay attached to the charger. Before gathering/folding up the charger cord, wrap the velcro around the cord and feed the velcro through its slot, so that it's tight around the single length of cord. Then you can gather/fold up the cord and wrap the velcro around the whole bundle. That way, the Velcro is permanently attached to the cord. In our house, I would lose the velcro while the charge was in use if I didn’t do this! Always great inspiration on your blog, Jen. Thanks! How do you use screws to anchor the power strip? Does your strip have some type of "bump-out" on each end to accommodate the screw hole? None of my strips have any way to attach screws so am wondering if I am just buying the wrong type of power strip, or if there is a way to use screws with standard strips and I'm just not smart enough to see it. Not all power strips are designed for this type of mounting, but you may be able to lock them in with screws on either end (not through the power strip) and pair with an industrial grade velcro to achieve the same effect. How have I lived for so (Very!) 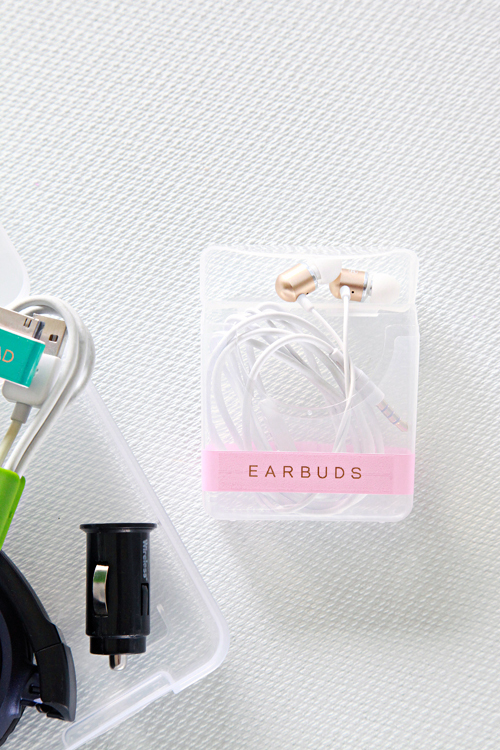 long without knowing I could put earbuds in those little Q-Tips cases. Genius!!! I love that one. I might have thrown out some Q-tips just so I could use the case right away. Thanks Jen - loved the post! What vinyl did you use? I just used a standard roll of vinyl that is typically intended for craft cutting machines. I find it on Amazon, Silhouette and Expressions Vinyl. 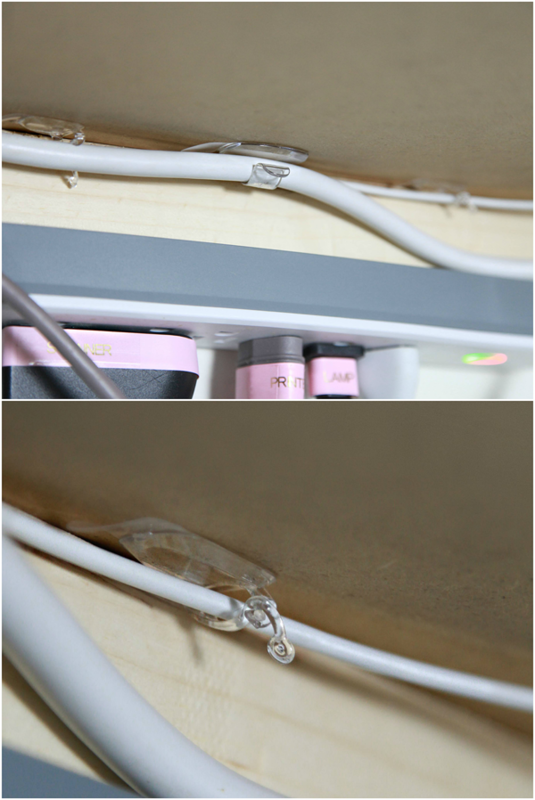 I used the 3M cord clips (or maybe the were Christmas light clips) to clip the electric cords from lamps down the posts of a book shelf so I did not have to see them. These are great. Great post- certainly something we can ALL relate to! This makes me want to tackle mine, and trust me- that has been the LAST thing on my priority list! Thanks for the inspiration :) Now I need a label maker like that! I just found this post and wanted to share something that I use instead of the Velcro ties. Velcro plant ties! http://www.amazon.com/gp/product/B006MYBURA You can cut them to the exact length you need which is perfect for bulkier cords. It used to only come in a roll of green, but I see that they make it in pink and yellow too. Great tip and product! Thank you for sharing Teri! !